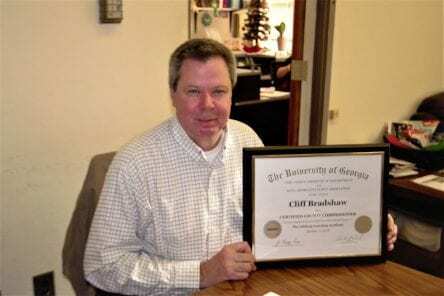 HIAWASSEE, Ga. – The Association County Commissioners of Georgia (ACCG) recently presented Towns County Commissioner Cliff Bradshaw with a certificate of completion for continuing the the educational requirements of the ACCG Lifelong Learning Academy. Created in 1914 when county officials united to help fund Georgia’s first highway department, modern-day ACCG serves as a catalyst for advancing counties throughout the state. According to ACCG, every class offered in the Lifelong Learning Academy has been designed to advance the functionality of county governmet by imparting new information to county officials. In collaboration with the Carl Vinson Institute of Government, ACCG has carefully sculpted the courses to offer officials the best tools and resources available to effectively navigate their role as a county official. Fetch Your News is a hyper local news outlet, attracting more than 300,000 page views and 3.5 million impressions per month in Towns, Dawson, Lumpkin, White, Fannin, Gilmer, Pickens, Union, and Murray counties, as well as Cherokee County in N.C. – FYNTV attracts approximately 15,000 viewers per week and reaches between 15,000 to 60,000 per week on our Facebook page. Next Article » Santa Claus was back in town for second annual "Light Up Hiawassee"